Jack Pearce is hoping to bring in more forwards before the start of the new season. Pre-season training has started at Bognor ahead of their first friendly against Brighton under-23s on Tuesday night. 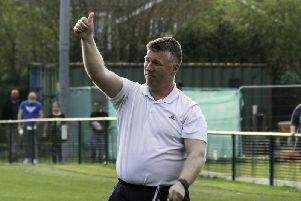 Talking about how pre-season is going so far, manager of the Rocks Pearce said: “Satisfactory is the word I would use. “If we have a concern, we’ve got the same concern that we had last year trying to find forwards. I am talking to plenty but no one wants to commit at this moment. “I am sure over the next couple of weeks some will but I would like them to commit because obviously as a manager I want them here. Pearce added: “We’re working hard on it and within the next 10 days, we need at least two, maybe three forwards we’ve got to bring in. On ambitions for the season, Pearce said: “Our target will be the same as it is every year for every club that kicks off. “Your ambition is to get promoted. The reality is you have to be logical about it. Former Portsmouth coach, Robbie Blake joined Bognor in the Isthmian League for the new campaign and has ‘settled in well’. Pearce added: “He’s brought in a few new things and he’s learning about the players and he has done very well. So we’re good. “People don’t realise how professional clubs at our level are. So he won’t be bringing in too much extra knowledge into us. “He’ll hopefully be able to help the forwards, once I manage to sign some because that’s a specialist area. But he’s done a good job. After Tuesday’s match with Brighton u23s, Bognor travel to Horndean on Friday July 20 before hosting a Portsmouth XI on Tuesday July 24.